Mark’s most popular keynote speech over the years has been “Daily Renaissance–How to Become Your Best Self” (previously known as Exploring Your True Capacity for Excellence). 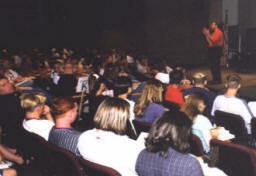 He has delivered variations of this speech to numerous and varied audiences. The above picture was taken during one of those speeches at Utah State University. What people like the most about this particular speech is the reminder they get that they are capable of doing way more with their lives than they might have thought. Mark discusses the fact that every human being is born with greatness, which can be discovered, developed, and used to contribute in positive ways to society.